Tune Up @ Subaru of Lethbridge Dealer Alberta. Chevrolet, Honda or Mazda Tune up? Doesn't matter, don't let the name Subaru fool you. We've have an all-make service lane for your non-Subaru tune up's When your vehicle is properly tuned ,the ignition system, fuel system, emission system and computer system are working in sync. This will result in peak combustion chamber efficiency, saving you money at the pump and peak performance and drive-ability of your vehicle. Q: HOW DO I KNOW WHEN MY VEHICLE NEEDS A TUNE-UP? A: There are a number of factors that could indicate that your vehicle is in need for a tune-up, including rough idling or acceleration, a decrease in your fuel efficiency, or even just your “check engine” light. Your owner’s manual might suggests a kilometer marker for regular tune-ups. Q: WHAT IS INCLUDED IN A TUNE UP? A: A typical tune-up includes the checking of air and fuel filters, spark plugs, wiring, cabin air filters, light bulbs, drive belts, fluids, PCV valves, and general systems. 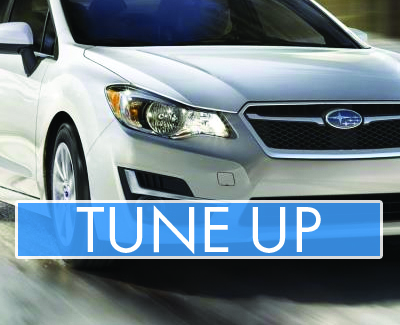 At Subaru of Lethbridge, we can cover any and all types of models for a tune up, so don't worry if you aren't a Subaru driver.